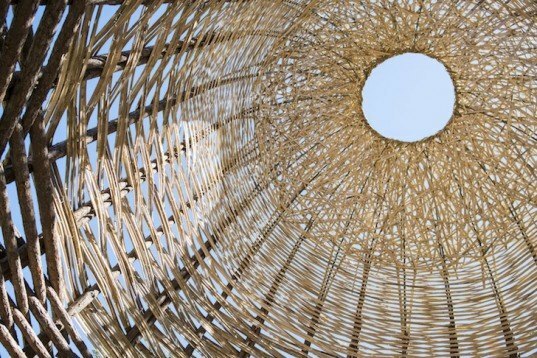 A big challenge at music festivals is finding shelter from the heat and sun, but a sprawling bamboo art installation gave attendees at last year's Woodwork Folk Festival plenty of shade to stand under. 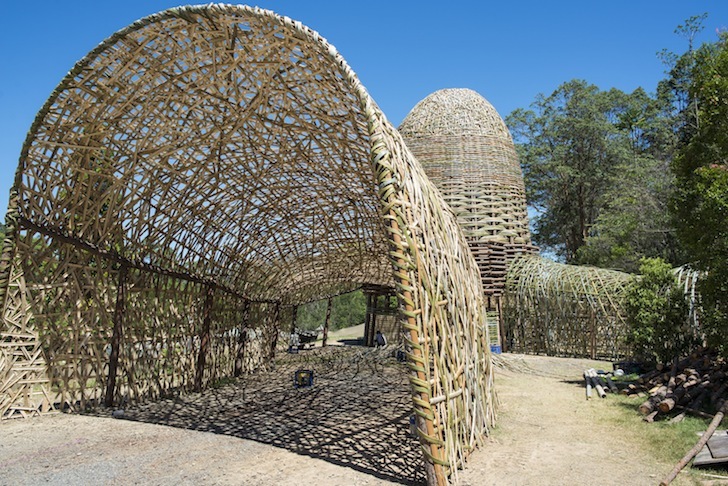 Taiwanese sculptor Wang Wen-Chih teamed up with the Sydney-based architecture and design-collective Cave Urban to create Woven Sky, a 300-foot-long shaded tunnel and tower installation in Woodford, Australia. Woven together from locally harvested bamboo and radiata pine logs, the sprawling tunnel took 40 workers and volunteers three weeks to build. Located north of Brisbane, the Woodford Folk Festival is an annual music festival that celebrates a wide variety of music genres for six days and six nights. Built as the entrance to the festival’s main amphitheater, Woven Sky was constructed from materials that Wen-Chih and the architects harvested within a 12-mile radius of the site. The final installation stretches 300 feet long and nearly 50 feet tall. Artist Wen-Chih applied a special basket-weaving technique he learned from craftsmen in the mountains of Chiayi, Taiwan to the Woven Sky project. Each bamboo pole was felled and then split into four to five pieces before weaved together like a basket. Much of the installation was built by hand with little dependence on machinery. The organizers of the Woodwork Folk Festival see the installation, which will stay standing for three years, as a symbol of inspired transition. Woven Sky was constructed from materials that Wen-Chih and the architects harvested within a 12-mile radius of the site. The final installation stretches 300 feet long and nearly 50 feet tall. Woven Sky was built as the entrance to the festival's main amphitheater. Artist Wen-Chih used a special basket-weaving technique that he learned from craftsman in the mountains of of Chiayi, Taiwan to the Woven Sky project. Each bamboo pole was felled and then split into four to five pieces before weaved together like a basket. Much of the installation was built by hand with little dependence on machinery. The Woodford Folk Festival is held annually on the Sunshine Coast in Queensland, Australia.